Only fill the cupcake liners halfway. Any more and they will be too full which will either result in the cupcakes sinking in the middle or you will have big mushroom tops. I use alot of buttermilk for everything form Buttermilk Pancakes to Buttermilk Pie. But if you don’t have any you can make an easy buttermilk substitute by adding 1 tablespoon of lemon juice or white vinegar to a glass measuring cup and then adding milk to the 1 cup line. Let sit 5 minutes before using. 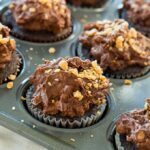 Buttermilk Chocolate Cupcakes with Toffee Frosting- a moist, tender cupcake topped with a thick, rich, and creamy toffee frosting with a little crunch. 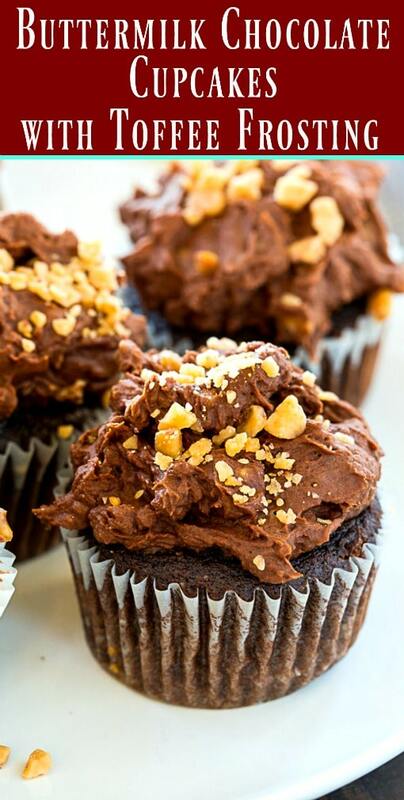 These cupcakes are wonderfully decadent. 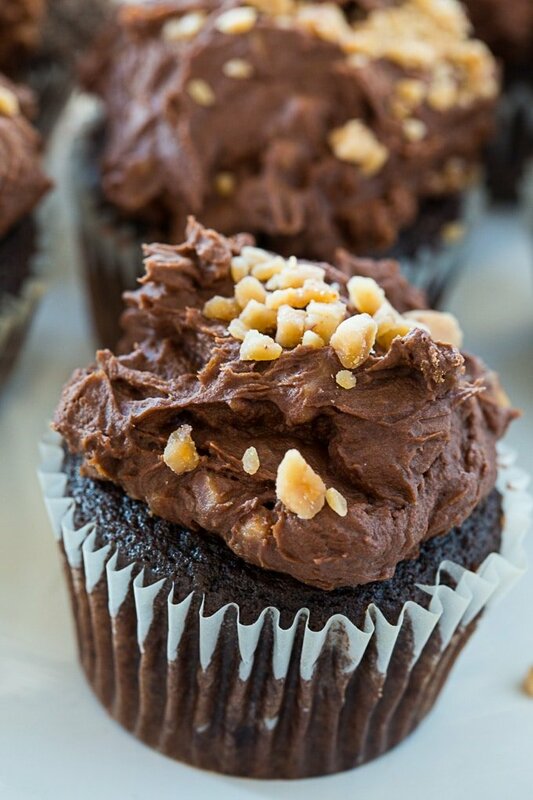 If you are chocolate obsessed, you will love these cupcakes. Preheat oven to 375 degrees and line 24 muffin cups with paper liners. Beat in eggs one at a time. Beat in vanilla. Scrape down the sides of the bowl. Add flour mixture to butter mixture, alternating with buttermilk mixture, and beginning and ending with flour mixture. Fill muffin tins halfway with batter. Bake for 15 to 18 minutes. Let cool before frosting. 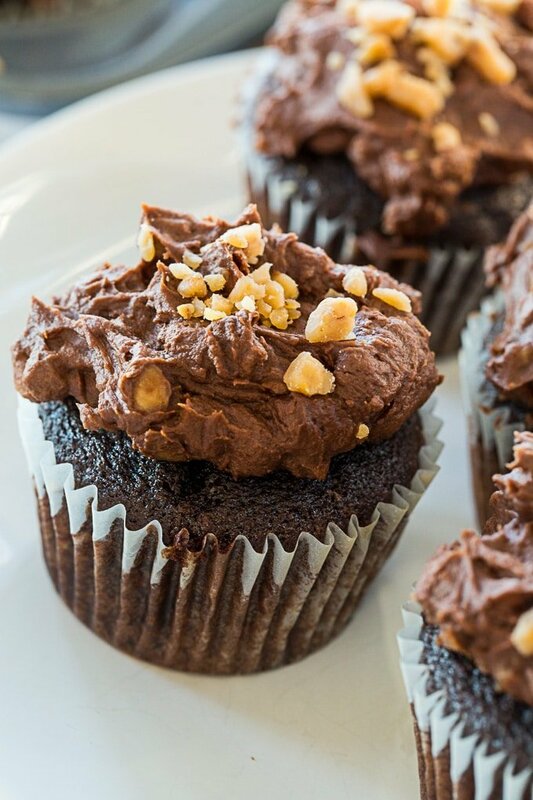 To make frosting, whisk together powdered sugar and cocoa powder. Using an electric mixer, beat butter with 1/2 cup of powdered sugar mixture until smooth. Beat in milk and vanilla and then the remaining powdered sugar mixture until smooth. Stir in 3/4 cup toffee bits. Spread frosting on cupcakes. Sprinkle with remining toffee bits. This entry was posted in Cakes and tagged buttermilk, chocolate, toffee. Bookmark the permalink. If I wanted yellow/white cupcake would I just substitute the same amount of flour for the chocolate? I love chocolate candy but when it comes to cakes I think I like yellow better. You would be better off using a recipe that is for a yellow or white cupcake. They look soooooo very delicious!!!! The frosting catches my fancy! Thanx for sharing! !